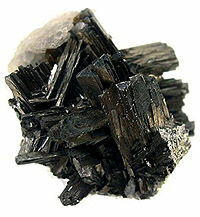 Arsenopyrite (arsenic pyrites), is a sulfoarsenide gland. Glance (glitter, glare) metallic, opaque. Colors stannum (tin)-white with yellow oxide tint. A line is black. Fracture, break uneven. Fragile. Cleavage perfect absolute. Crystals (monoclinic Crystal structure) columnar, basaltiform, needle with the sharp longitudinal shading. Continuous the masses are grainy to downlow. 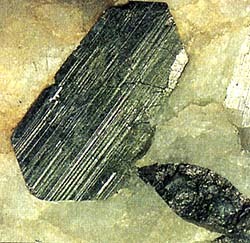 Main ore of arsenic. Places of distribution: Germany (Garc, Ore mountains, Saxony), Sweden. England. A white or grey metallic mineral consisting of a sulphide of iron and arsenic that forms monoclinic crystals with an orthorhombic shape: an ore of arsenic. Formula: FeAsS Also called: mispickel. Composition of arsenopyrite rarely corresponds an ideal formula. More frequent he contains the two-bit of other metals, including gold, silver, cobalt. The last can also partly deputized iron; the variety of arsenopyrite, getting the name of danaite (cobalt), appears in this case. Crystallizes in monoclinic Crystal structure, although his crystals have a clear pseudorhombic type, and can be prismatic. Verges are here distorted and streaked. Chasty twins which have a form of cross or star, and very showy. The massive accumulations of dense or grainy addition are ordinary also. Opaque. Colors whitish to steel-grey. Glance (glitter, glare) typically metallic. A mineral is hard and as heavy as lead, fragile frail brittle, easily disintegrates on the planes of cleavage. In the sprinkle of snow - black. At a blow sparkles the hammer of Arsenopyrite, like a Pyrite, with the selection of garlicky smell, testifying to the presence of arsenic. Crushed in powder, at heating in a test kimberlite tube at first forms scales, covered pollen of sulfide of arsenic of pinkish-yellow color which is besieged from steams on the walls of test kimberlite tube. At the proceeding heating powder becomes grey-black and transformed in a metallic arsenic. 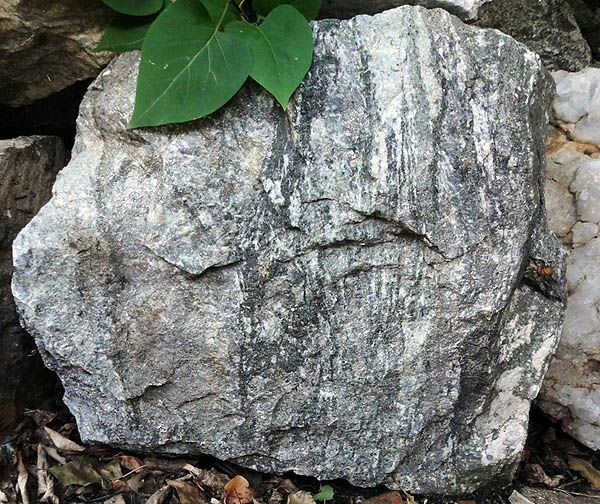 Arsenopyrite - widespread mineral; it be found in the different types of rocks. Mainly hydrothermal. Crystallized one of the first. Be found in pegmatites, and also in gneiss and other metamorphic rocks. In the ore deposits of Arsenopyrite often is in gold-quartz vein, lode, mines and accompanied the minerals of tin. In Italy not uncommon, found in the great number of places. It be found in gold ore quartz vein, lode, mines which are developed in an area Monte-Rose, where at one time there was a great number of gold-diggins. There found the beautiful crystals of arsenopyrite; good standards are also in pegmatites Pi-mesons (province of Lechche) and age-old mine of Kalcheranikaal-Lago (province of Trento). 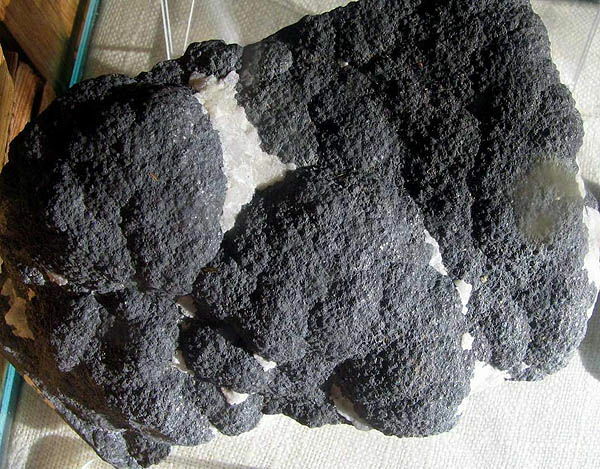 In near the pas of Arsenopyrite as dense the masses was so widespread in Baku-lochchi (near Villapucu, area of Kalyari), that he was developed there by an industrial method. 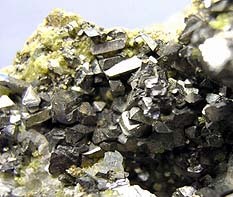 Arsenopyrite - main ore mineral, which an arsenic is extracted from. It also is excellent mineral raw material for the receipt preparation of silver, gold, cobalt and other metals which it is been by the by-products of basic production. Arsenopyrite. Druse of prismatic crystals from spherulites Calcite. Frayberg, Saxony, Germany. A photo: © A.A. Evseev. Arsenopiritovaya lived. Trifonovskaya, Kochkarskoe mine (Au), Layer, Ю. Ural, Russia. Arsenic. A photo: © A.A. Evseev. Arsenic. Belorechenskoe mine, Sitting. Caucasus, Russia. ~10x7 sm. A photo: © A.A. Evseev. Arsenopyrite is mixture of arsenic and sulfide of iron and belongs besides to the type, what Pyrite, or sulfide of iron (also for deceitful look like silver urgent "silver of fools"). But if a Pyrite can be counted relatively harmless, it can not be said about an arsenopyrite, containing heavy additions of arsenic. 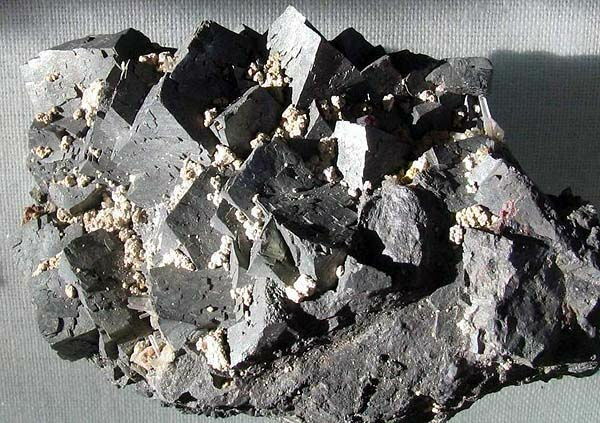 A characteristic sign of mineral is a strong "garlicky" smell (so an arsenic smells in general and carcinogenic pair from an arsenopyrite in particular), arising up at mechanical influence or heating. For example, if at a blow to the natural bar a hammer is carve sparks and for a short time there is a smell of garlic, therefore, dangerous Arsenopyrite - right in front of you. In likeness with silver and other silvery metals (by platinum etc.) the danger of people, reflexly persons interested to hold for some the time in hands such "riches" or even to touch to him is hidden. A if then carefully not to wash down a hand and go to prepare ride, and then to use it, consequences will be most serious. A toxic action can render the dust of Arsenopyrite minerals (accumulates in lights and bronchial tubes). The arsenic contained in them stipulates the followings symptoms of poisoning: stomach-ache, disorder of chair, difficulty of swallowing, vomiting, decline of arteriotony, dehydration. Stupor (dormancy), coma (unconscious state), cramps (contracture, contraction, deformity) and death is possible also (brain). The weak poisoning can appear at the insignificant receipt preparations of arsenic (fever, insomnia, loss of appetite, defeat of hepar and buds and other). Arsenic compound widely used in agriculture, different industries of industry, and also in medicine. Arsenic of low-toxicity, and his connections are very poisonous. Connections of trivalent arsenic of toxicant, what connections of fivevalency. However able connections of fivevalency arsenic in the conditions of organism are to be restored in trivalent. The toxic dose of preparations of arsenic at a reception inward (in a count on a clean arsenic) is 0,01 g, mortal - 0,1-0,6. Compounds of arsenic get to the organism through respiratory tracts and digestive vehicle. Accumulate in an organism mainly-in bones, buds, mucous membrane of bowels, hepar, to the spleen and, especially, in hairs, nails and skin. An arsenic is selected slowly, mainly by buds and bowels, and also by sweat-glands, with milk for feedings women. The cyclic organic and inorganic compounds of arsenic appear in the organism of type of arsenite, which are characterized durability of chemical compounds and high toxicness. At the sharp poisonings preparations of arsenic are violate the function of cns and vehicle of circulation of blood foremost (weakening of cardiac activity, paralysis of capillaries). Dehydration of organism because of the persistent vomiting and diarrhoea results in condensing of blood, haemolysis of red corpuscles, acidosis. A hepar and buds is struck, as a result there is sharp hepatic-kidney insufficiency. Depending on character of clinical picture distinguish two forms of the sharp poisoning inorganic preparations of arsenic - gastroenteric and paralytic. At a gastroenteric form through 30 mines - 2 hour and more after the reception of arsenic metallic taste is felt in to the mouth, maring in the cavity of mouth and in a pharynx, pain and burning on motion a gullet (after a breastbone), persistent repeated vomiting, great pain in a stomach. From rapid dehydration there are thirst, loss of turgor of tissues, voice do hoarse or soundless, pain and cramps is marked in gastrocnemius muscles. An increase and sickliness of hepar, hemoglobinuria, oliguria, oliguresis, oligohydruria, scanty urination or anury, drop in the temperature of extremities comes. In heavy cases are cyanosys (dark blue lips, nails, skin) because of insufficiency of breathing, decline of arteriotony with frequent, bad filling with a pulse, general convulsive reaction. A mortal end comes in 1-2 days after the reception of poison. A paralytic form is observed at a reception into plenties of inorganic compounds of arsenic. Thus during a few clock a weakness, adynamy, adynamia, sense of fear, deafness, develop after poisoning. Twitches are marked in gastrocnemius muscles, cramps, loss of consciousness, collapse, coma and death from the stop of breathing. A digestive vehicle is not struck or changes insignificantly. At the hit of arsenic in a stomach - immediate washing warm water and взвесью of absorbent carbon. After a red cinnabar (sulfide of mercury, salt of liquid in the conditions of Earth metal), an arsenic (As) and his compounds (arsenates) is a basic weapon of poisoners of Europe (Bordzhia). By compounds of cinnabar Napoleon was venenate on the island of Sainted Helen (Europe). Poisons of Lokusty were "famous" in Rome; in Venice held poisoners (gondolas). Symptoms of the arsenious poisoning are metallic taste in to the mouth, vomiting, great pains in a stomach, cramps, paralysis, death. In small doses an arsenic needs the organism of people: it hinders the loss of phosphorus. There is an about 15 mg of arsenic in the organism of people. In the organism of people of compound of arsenic get with drinkable and mineral water, vine wines and juices, marine products seafood, medical preparations (pharmacology), pesticides and herbicides. An about 80% arsenic is sucked in in a gastroenteric highway, 10% acts through lights and about 1% - through a skin. More than 90% inorganic compounds of arsenic of soluble and absorbed. Further an arsenic moves in a hepar, where he methylate. Accumulates in lights, hepar, skin and thin intestine. Deposited mainly in the reticuloendotheliosis system, as a result of compound of arsenite with SH-groupof albumens (aggressive). In 24 hours 30% hatches arsenic with urine and about 4% - with an excrement. Negligible quantities retire with then, with falling out hairs, scaling skin and bile. An arsenic influences on oxidizing processes in mitochondrion, mitochondrium, participates in a nucleic exchange, I.e. has a direct relation to the synthesis of albumen, and needed for the synthesis of haemoglobin, though not included in his composition (catalyst). Signs of insufficiency of arsenic: for a people are dermatitises, anaemias; at animals is a decline of growth and crackpot reproducing, characterized a high mortinatality. Other symptoms: lowered concentration of triglyceride whey of blood. Surplus of arsenic in a ration causes in the organism of animals ("effect of rabbit") anomalous fecundity which is characterized the considerable increase of sexual activity and fecundity. Reasons of surplus of arsenic: surplus receipt preparation (permanent contact with an arsenic, contamination of environment, smoking, abuse of vine wine and juice is a "effect of Greece", protracted introduction of preparations), violation of adjusting of exchange of arsenic; accumulation in the organism of arsenic at insufficiency of selenium. Basic displays of surplus of arsenic: crabbiness, head pains, violation of functions of hepar, development of fatty hepatosis; allergic cutireactions, eczema, dermatitis, itch, ulcers, depigmentation of skin, palm-sole hyperkeratinization; conjunctivitis; defeats of the breathing system (fibrosis, allergosis, allergopathy, breach of nasal partition, tumours); the defeats of vessels (above all things - lower extremities) nephropathy, increase of risk of development of new neoplasms of skin, hepar, lights. Remote consequences of intoxication: decline of sharpness of ear for children, defeats of the nervous system (encephalopathy, cerebropathy, allolalias, co-ordinations of motions, cramps, psychoses, polyneuritis, multiple neuritis with a pain syndrome), violation of trophism of muscles, immunodeficit. At the sharp poisoning an arsenic there are stomach-aches, vomiting, diarrhea, oppressing of cns; develop: intravascular haemolysis, sharp kidney, hepatic insufficiency, cardiogenic shock. Likeness of symptoms of poisoning an arsenic with the symptoms of cholera allowed to use compounds of arsenic (trioxide of arsenic) as mortal toxin. On territories, where surplus of arsenic is, it accumulates in a thyroid for people and causes an endemic goitre. An arsenic in small doses is carcinogenic. Arsenic mineral waters apply at treatment anaemia and gastroenteric diseases. It enters in the complement of mummy (substance used in folk medicine) , medicinal bitumen - mineral-organic matter. It is applied at treatment of sleeping-sickness. An arsenic is needed: at inflammatory processes, caused a протозойным and microbal defeat, at an allergy, anaemia, for the increase of appetite. In experiments it was succeeded to decrease morbidity a cancer by the neat doses of arsenic (after operations on the delete of lymphonoduss). Food sources of arsenic: fish, shellfishes, shrimps, krill, spiny lobsters, lobsters, laminaria (oarweed), rice is wild, grain and products of breadstuffs, lentil, carrot, vine, strawberry, raisin. The fars of arsenic are contained in cod-hepar oil and saltwater fish (to 10 mg/kg), wines (to 1 mg/l and more). In water of arsenic less than 10 mcg/l, in some regions of the world (India, Bangladesh, Taiwan, Mexico) maintenance of element arrives at a 1 mg/l, that is reason of overdose by an arsenic and requires development of the sanatorium-resort system (kimberlite).